In the first article in this three-part series on financial planning for retirement, I introduced an approach for answering the all-important question, “Can I retire?” The article focused on the first step: Calculating your essential living expenses in retirement. 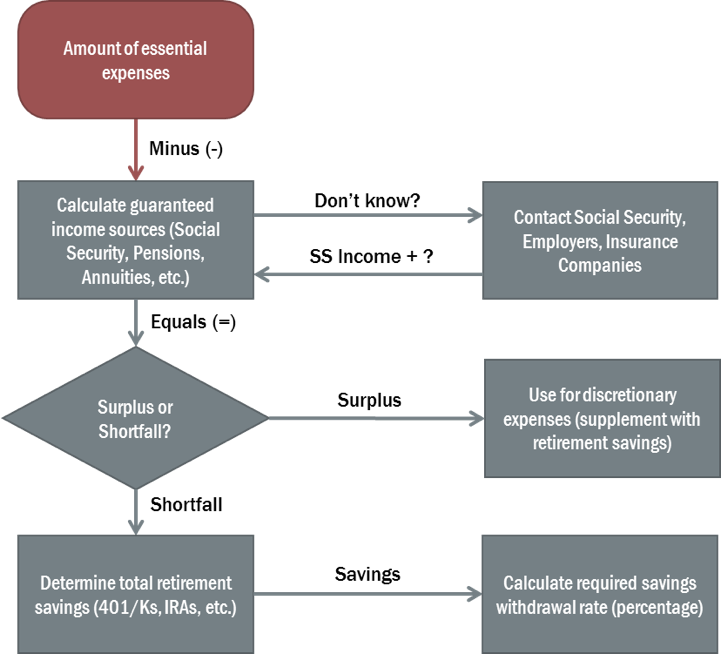 In this article, I am going to discuss the second major phase of the process: Identifying and quantifying your “guaranteed” income sources (shown in gray in the diagram below) and calculating whether they will cover your essential living expenses. I’ll also consider your “non-guaranteed” income sources (i.e., retirement savings and other options) and how they come into play if you have a shortfall in your ability to cover your essential expenses with guaranteed income. In the third and final article, I’ll discuss your “sustainable” withdrawal rate from savings and what options you have if it isn’t. This part of the process begins with the assumption that you have come up with an estimate of your essential living expenses in retirement using one of the methods I described in the last article. The calculation is shown as an “input” by the red box at the top of the diagram above, which is our starting point. Do that first. To continue the illustration from the first article, let’s say that your pre-retirement income is $75,000/year, but you have calculated that your essential living expenses in retirement would be $58,500 – approximately 22 percent less. You’ve decided that is the minimum amount you need to be able to fund in order to be ready to retire. We’ll use that number to help illustrate the process as we go forward. And remember, we’re talking only about essential living expenses, not discretionary expenses such as extra giving, travel, entertainment, etc. Now that you’ve got a handle on what your essential expenses might be in retirement, the next step is to determine what your “guaranteed” income sources will be. As you can see in the diagram above, I’m referring to things like Social Security, pensions, and to a lesser extent, annuities. I’ll consider your retirement savings a little later in the process. Another important thing to keep in mind is that both you and your spouse may be eligible to receive Social Security benefits even if only one of you is employed. Non-employed spouses or those who have not received enough benefit “credits” through previous work are eligible to receive 50% of the working spouse’s benefit. This provision is a great help to many, especially those who need to rely mainly on Social Security for income in retirement. As I noted above, your benefits will change based on when you start receiving them. If you plan to retire later than your “full retirement age,” then be sure to use the larger number. It’s also important to remember that your benefits may not be the same from year-to-year. That’s because they are inflation-adjusted, one of the most positive features of the Social Security benefits program. Social Security is a particular type of pension. But candidly, one of the things that Social Security lacks that commercial firms are required to do is to fully fund their pension plans as their liabilities grow. Social Security, as it turns out, has substantial unfunded future liabilities. This is why you hear a lot about Social Security going bankrupt sometime in the future when liabilities exceed the available funds. Without major changes, Social Security will technically be insolvent in less than two decades. According to the most recent Annual Report of the Board of Trustees, Social Security will only be able to pay about 75% of scheduled benefits starting in 2034. That is mainly due to a projected reduction in the ratio of reserves to projected costs, which peaked in 2008. In light of this, depending on your age, it may be reasonable to question whether Social Security will be there for you or not. If you are in your 50s or 60s, my answer to that question would be, “yes, very likely.” However, it’s possible that benefits could be reduced in the future, possibly on a means-tested basis. If you are much younger, in your 20s or 30s, it may not be around, at least not in its current form. You should plan accordingly and if that turns out not to be the case then all the better. Under the current Social Security benefit schedule, if you are making $75,000/year can expect Social Security to replace approximately 38 percent of your income in retirement. If you are married, Social Security will replace an additional 19 percent (50 percent of 38 percent), for a total of 57 percent. Returning to our illustrative income number, this means that Social Security will provide $42,750 of the $58,500/year that you need to pay your essential expenses, leaving $15,750 that needs to come from other sources to make up the shortfall. Many of you reading this won’t have a Defined Benefit Pension. Most companies have done away with them or are in the process of doing so. The main exceptions are local, state, and federal governments. If you do, congratulations – you’re one of the fortunate few. If you are one of the fortunate ones, you just need to find out what your pension fund will pay out in retirement. You may receive a quarterly or annual pension statement, or you can just access your employer’s pension website or contact the human resources department. Most pension plans offer different payout options, including full or partial lump sum, monthly or quarterly payments, etc. Some are adjusted for inflation, but most are not. If you choose a lump sum option, then you can’t include that in your “guaranteed” income stream going forward. That’s because you will have to do a lump-sum rollover into a qualified retirement savings account such as an Individual Retirement Arrangement (IRA). That is a very, very important decision that should not be taken lightly so make sure to do your homework before you decide to do that. If you take a lump sum, you will have to figure out a way to construct your own private “pension” based on how you create an income stream from those savings. For that reason, many people would do better to take the lifetime distribution instead. Plus, the pension payout may be higher than what you could get with a personal annuity or other options. Some companies do have underfunded pension liabilities, which Investopedia defines as “the obligations to pay pensions under defined-benefit retirement plans, exceed the assets (the investment portfolio) that have accumulated for the purpose to fund those required payments…. [which are] a combination of invested corporate contributions and the returns on those investments.” But this is more of a risk to the company than an individual pensioner. That because it can impact a company’s financial performance and possibility even its solvency in the future. I include annuities in this category, but that may be a mischaracterization to some extent. Most people won’t seriously consider purchasing an annuity until after retirement, but some do beforehand, typically in a non-tax advantaged account (i.e., non-IRA). Annuities can produce “guaranteed” income, but as we shall see, that doesn’t mean they are risk-free. If you did purchase a deferred income annuity before retirement, you could elect to start receiving regular annuity payments after you retire. The amount of your payout will depend on the amount of principal (whatever you invested plus growth) and your age when you start receiving it. Depending on your annuity contract, those payments are “guaranteed” for life. If you purchase an annuity after retirement, will most likely be a variable or indexed annuity, or a single premium immediate annuity (SPIA). With variable and indexed annuities, the value of your principal can vary based on the performance of individual financial markets. Consequently, your income can go up or down based on the performance of the underlying investments. With SPIAs, you receive a fixed payout that will not change unless it is adjusted for inflation. Annuities can provide a valuable income stream in retirement. They are similar to Social Security and pensions in that they provide a “guaranteed” income for life, can be adjusted for inflation, and make payments to your survivors depending on the terms of your annuity contract. Like Social Security and pensions, annuities are considered low risk. However, in a worst-case scenario, there is solvency risk. Annuities are often sold as ultra-safe, guaranteed assets. But in reality, they function more like an insurance policy than anything else. In fact, if you buy one, you will be asked to sign an annuity contract with an insurance company. When you do, you are assuming that the company will be in business and able to make payments to you for at least as long and you and your spouse are alive. Normally, that would be a pretty good bet since such companies are heavily regulated and insured, and most are VERY profitable. (Look at the commissions and fees on some of these products, and you’ll understand why.) But solvency risk could be a concern in extremely bad economic times as the ability of these companies to make payments is somewhat tied to the performance of the financial markets and also to their broader business. Your annuity payments will vary based on terms of your contract and the age you start receiving them. You will need to contact your insurance company to get the specifics. Now we come to the moment of truth: Will you have enough guaranteed income in retirement to cover your essential living expenses? You can get the answer by doing some simple math. Just subtract your total essential expenses from your total guaranteed income to find out if you have a surplus or shortfall. If you have a pension or deferred annuity income in addition to Social Security, you may have a surplus. That means your guaranteed income sources exceed your essential living expenses. As shown in the diagram, you’ll have something extra for discretionary expenses, especially if you have additional income available from your retirement savings “bucket.” Those funds can also help with increases in your essential living expense due to inflation. You may not want to stop there, however. It would be a good idea to go ahead calculate how much income you can expect to receive from your retirement savings and exactly how much you may want to withdraw. That will tell you how much “margin” you will have regarding discretionary giving and spending. In our illustration, if you have no guaranteed income sources other than $42,750 from Social Security, you will have an annual shortfall of $15,750 that needs to be made up by income from other “non-guaranteed” income sources. Does that mean you can’t retire? Well, it might, but we still have work to do since we’ve only considered your guaranteed income sources in our analysis. The next step is to determine how much income you would need to generate from your savings (“non-guaranteed income”) to cover the shortfall. Regardless of whether you have a shortfall or not, you will want to know the total value of your retirement savings – your 401k, 403b, IRA, and similar accounts. 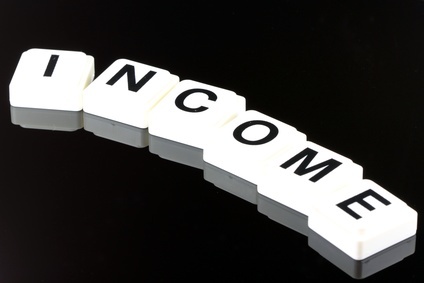 I refer to these as “non-guaranteed” income sources because, unless they are in Federally-insured accounts, payouts in any amount for any period are not guaranteed. That’s because the underlying investments can lose their value, and could theoretically even go to zero in the most extreme (think “catastrophic”) economic circumstances. But as we all know, that is highly unlikely. Even on the worst days during the two worst stock market crashes in history (in 1929 and 2008), the market never went to zero, not even close. Not to mention that the markets eventually came back and also surpassed their pre-crash levels. The more conservatively you are invested (think US Treasuries and insured accounts like CDs and savings accounts), the less likely you are to suffer extreme losses. If you are very close to retirement, coming up with a total should be reasonably easy. You just need to look at your most recent statements and add them up. If you are quite a few years out, things get a little trickier. I’d be the first to admit that estimating the future value of any investment is challenging, especially given the amount of market volatility we’ve seen in recent years. Some tools can help with this. They are based on your current and projected savings rate, an estimated rate of return, etc. Since the value of your savings will fluctuate year-by-year, and may even have a negative return in some years, my advice is to be conservative in your estimates. Just because your account gained 12% last year doesn’t mean it will do so for the next 5 to 10 years. In fact, many economists estimate more modest stock market returns in the 4 to 7 percent range for the next ten years or so. In this case, you would be in pretty good shape since, as we shall see in the third article, a required withdrawal rate of 3.5 percent is considered to be sustainable in a long retirement. The problem is that it doesn’t leave much if anything for non-essential, discretionary expenses. Based on the simple math, you can see that the higher your essential expenses in relationship to your guaranteed income courses, the higher your required withdrawal rate from savings will need to be to cover them. Similarly, the lower your retirement savings, the higher the withdrawal percentage will be. For example, let’s assume that your essential expenses stay the same ($58,500) and there is no change in Social Security income. But let’s also assume that your retirement savings are 30 percent less, or $315,000. In that scenario, your shortfall is the same, but your required withdrawal rate goes up to 5.0 percent ($15,750 divided by $315,000). If your savings are 30 percent higher, or $585,000, your required withdrawal rate would decrease to 2.7 percent, which would be considered even more sustainable than 3.5 percent. We’ll discuss much more about withdrawal rate “sustainability” in the next article. If you have gotten this far and have found that you have an income shortfall, or that your required withdrawal rate is relatively or even prohibitively high, you may be tempted to become anxious or fearful. Well, it is NOT my intention to cause you any concern, but better to understand the realities of your situation than not. If that is you, please remember that we haven’t completed the process yet. We haven’t considered all the options nor have we looked at all the other possible sources of income in retirement, such as part-time work, annuities, tapping home equity, etc. We’ll tackle those in the third and final article in this series. The best antidote for anxiety is faith and trust in God and also gaining understanding, wisdom, and knowledge about our situation so that we can do the best we can with whatever God has given us to steward – before and during retirement.